Creativity, ingenuity, and innovation are the keys to success in the evolving global economy. To prepare young people for work and life in the 21st century, educators must cultivate students' creativity says a renowned educationalist Jennifer Henderson. HOPE has always been supporting activities which bring about the best of its students. Such activities enhance the skills of the students and they feel confident about what they do. This in turn plays an important role in increasing the confidence level of the students and they work hard to hone their skills to compete in this ever evolving world. Recently students of HOPE took part in a poster making contest. This contest was held by Pakistan-Japan Cultural Association in collaboration with Consulate General of Japan, Karachi and Karachi Metropolitan Corporation at Hotel Avari Towers as part of the Japan Fest 2014. This initiative was held in order to deepen the understanding about Japan among the young generation of Pakistan and promote friendship between Pakistanis and Japanese further. 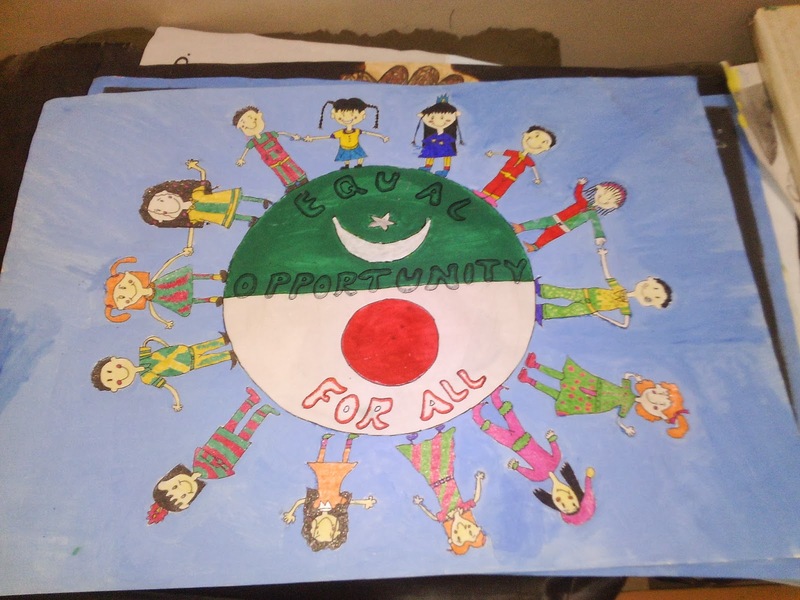 This Poster Contest aimed at giving more exposure to the future leaders of Pakistan to demonstrate their talents and encourage them to express their thoughts clearly through artistic creation. Students of HOPE, an educational NGO in Pakistan, thoroughly enjoyed taking part in this contest and hope that such events will be organized in future too so that they can show their talent to others around them. Dr. Mubina Agboatwalla, child specialist in Karachi lauded the efforts of PJCA for arranging such an interactive event where children were able to show cast their creative skills. Dr Mubina Agboatwalla hopes that PJCA will continue to arrange such activities so as to provide learning opportunities to less fortunate children of HOPE schools. She is of the view that such activities enable students to learn new ways of communication with the masses and become innovative individuals of our country. NGOs are working towards the betterment of society; however for this purpose different nonprofit organizations perform different tasks to keep checks on the working of its processes. This is not an easy ordeal; a regular and continuous supervision is required to make sure that each job is done according to the required standards laid down by the organization. Sometimes, it is because of this supervision that the field workers of NGOs have to travel in the scorching beam of heat, under the thunderstorms, in the valleys which are spread over mountains to reduce and avoid redundant practices. For this purpose, HOPE an NGO in Pakistan team visited Muzaffargarh… HOPE an educational NGO in Pakistan which runs under the leadership of Dr. Mubina Agboatwalla, child specialist in Karachi. HOPE has set up a formal school system in Muzaffargarh. The school currently has 350 students and 15 teachers. There is a computer room and a vocational centre as well. On the first day of their visit, the team monitored the overall performance of the children regarding class participation, confidence, physical health and their ability to comprehend the subject matter. They were also given snacks. On the second day HOPE school arranged a sports day in which Dr. MubinaAgboatwalla, child specialist in Karachi distributed certificates to the position holders. The students were also given sweaters to save them from the cold weather. Third day was the Annual day in which Dr. Mubina Agboatwalla,child specialist in Karachi was made the chief guest. She distributed gift hampers given by Jaffer Public School as a token of love and respect to the less privileged students of HOPE school Muzaffargarh and also gave school bags to the students of HOPE school. HOPE team also visited Vocational center of HOPE in Muzaffargarh in which around thirty women are learning skills such as sewing, cutting, embroidery etc. This vocational center also has a computer lab which enables the less privileged to learn computer skills free of cost. This Vocational center was built with the help of generous donation given to HOPE by PARCO. HOPE team is particularly thankful to Mr. Safdar Bukhari and Mrs. Iram Bukhari for their unprecedented support which enables HOPE to carry out its monitoring procedures in Muzaffargarh every year. Regular supervisions have made us able to locate our loopholes and rectify them as much as possible to achieve best possible results. There are trained supervisors at HOPE who have built a culture that values supervision.